Three years ago, the leadership of Holy Apostles began to envision a plan for our ever-growing, active church family and its place within the Collierville community as a whole. The result is a proposed Master Plan for buildings that speaks to the needs of our warm, welcoming parish and aligns with our goals for the future of our mission and ministry. I’m writing on behalf of the Vestry to update you on the current status of the potential capital campaign. Having received your feedback from the Feasibility Study, and the recommendations from our consultants, we have asked the architect and a contractor to provide us with an actual cost for the addition of the new education and meeting space. This “phase” was identified in the study as the highest priority. Building this space will also require improvements and changes to infrastructure such as parking and drainage. We anticipate having the cost of the project in the next few days. Once that information is received, the Vestry will prayerfully discuss our options for moving forward. Discussions and decisions will be communicated and shared with the entire parish family as they take place. 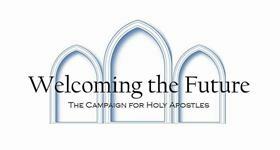 Thank you for your support, your prayers and your commitment to Welcoming the Future. Episcopal Church Foundation (ECF) has gathered your thoughts regarding our vision and the proposed Master Plan, and has prepared a report of the results. Our consultant, Nick Sollog, visited with us on Sunday, March 6th to present these findings. CLICK HERE to see a copy of the FS report. CLICK HERE to view a copy of the Tentative Case Statement. This document gives history, presents the needs and summarizes the plans and costs.